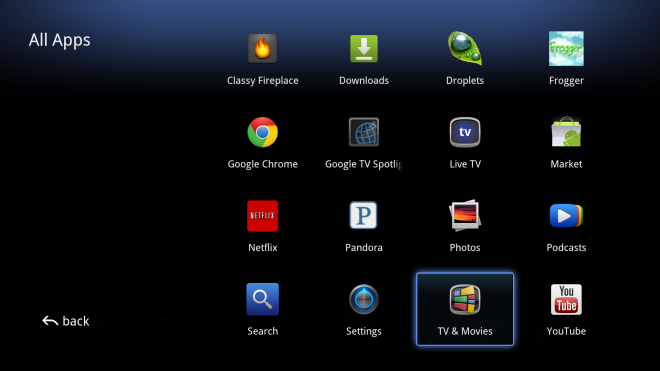 The new version of Google TV includes direct access to Android Market. 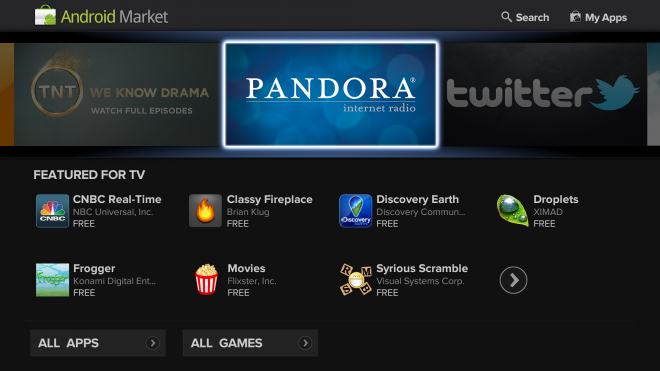 A select group of 30 apps, directly optimized for Google TV, will appear in the Featured For TV section shown above. Hundreds more -- Google TV-compatible, but not expressly optimized -- will surface if you dig further. Google’s smart TV software platform, Google TV, is poised for its first significant overall since it launched in Logitech and Sony hardware a year ago. Via over-the-air updates that should begin streaming to hardware devices on October 30, Google TV users will find new TV-optimized Android Apps, an improved YouTube experience, and new features that provide easy, direct discovery of TV and movie content. All this Googly goodness is wrapped up in a new user interface that aims to simplify a challenging information design — a design that’s left many Google TV customers with a persistent sense of yuck. When Google TV launched, it was supposed to seamlessly co-mingle “live TV” (read: broadcast, satellite and cable) with streaming video services like YouTube, Netflix, and Amazon Video On Demand. You could also use your Google TV software to search the web, and even access digital content from your home network or attached storage. Whether you were running a Google TV set-top box manufactured by Logitech or Sony, or directly tapping into the Google TV software installed in various Sony TVs, you were faced with a series of menus that defied easy access and discovery of the content you actually wanted to see. And it’s also possible you bought your Google TV in the mistaken belief that it’s a “cord-cutting” platform — that it would allow you to nix your cable or satellite service, and instead watch your favorite TV shows via direct Internet streaming. So, no, Google TV can’t be your all-in-one, zero-compromises, Internet-only video delivery system. But what it can do well — namely, deliver YouTube, Netflix and other web-based video to your HDTV — is about to get better. I recently traveled to Google’s headquarters for a hands-on demo of the new software, and what I saw is a substantial improvement over Google existing (however compromised) status quo. These may not seem like big changes — unless you’re already using Google TV, and have spent the last year coping with a cluttered, “something’s sort of ‘off’ here” U.I . 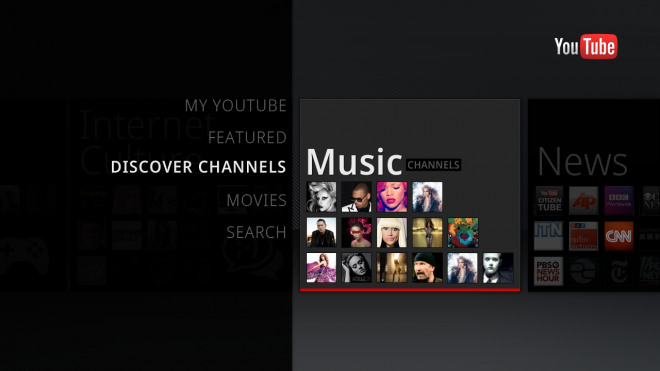 From what I saw in my hands-on demo, various key interface elements have been tweaked and finessed to do away with Google TV’s previously horsey (or at least user-antagonistic) design sensibility. OK, I’m not sure I want my friends — let alone the great unwashed Internet masses — nudging me toward the last 15 minutes of Bridalplasty. But I’m still heartened to learn that Google thinks a content-surfacing tool for Bridalplasty is an interesting thing to build. 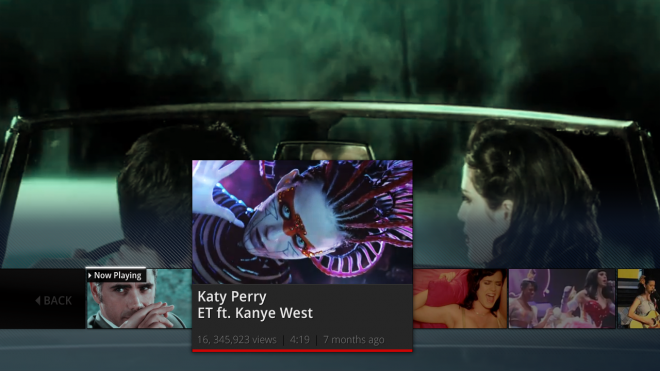 In fact, for its YouTube and Netflix features alone, I think Google TV — even the first version of the platform — is a smart purchase for anyone who can’t already get these content streams from existing living room hardware. After all, Logitech’s Google TV set-top box, the Revue, costs only $99. 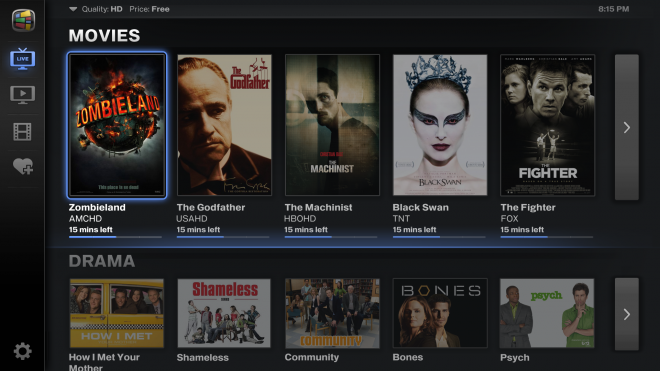 The real app gems, however, will be found in Google TV’s “Featured For TV” section. These apps — 30 should be available at launch — have been expressly developed for big-screen deployment, and Google TV’s unique talents.